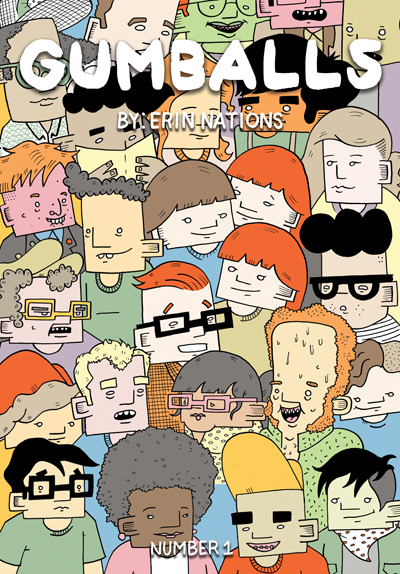 Coming December 21 from Top Shelf is Gumballs, a solo-creator anthology by Erin Nations. Of more interest, though, is the subject matter. Among other topics, Nations covers gender transition. Nations is the first openly transgender cartoonist published by Top Shelf. Gumballs is also the first comic-format project published by Top Shelf since The Surrogates by Robert Venditti and Brett Weldele ran from 2005-2006. Back then, we thought bookstores and bigger formats were the future, but now, instead of there being one major way to make comics, the industry has exploded with options. That means choosing the best format for a particular project, and with a lower sample cost (and Top Shelf’s IDW parent, which does many more serialized releases), the traditional issue makes sense here. Gumballs #1 can be ordered from comic shops now with Diamond code OCT16 0481 ($3.99 for 32 pages). There’s also a subscription cover variant, but since that image isn’t yet available, it’s kind of pointless to mention.